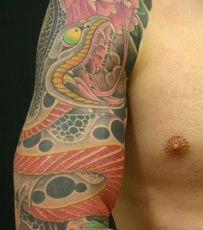 The Japanese word, for the insertion of ink under the skin to leave a permanent decorative mark, is Irezumi. 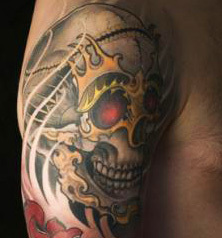 It is thought that Japanese tattoos date back as far as the Paleolithic or Jomon period around 10,000 BC. However this claim has been debated as not all scholars agree that the distinctive cord-mark patterns found on the bodies and faces from the era do in fact represent tattoos. However, those who do believe that Japanese tattoos at that time, had both decorative and spiritual meaning. Between 300BC and 300 AD, the Yayoi period, however there is no debate as the tattoos of that age were reported on by visitors from China. During this period tattoos were used as a status symbol as well as having decorative and spiritual meanings. However after 300AD and up to 600AD this tattoo style became synonymous with criminal activity and began to take on a far more negative connotation as being tattooed was used as a punishment. The kind of decorative Japanese tattooing that we know today started to develop around the time of the Edo period from 1600 to 1868 AD. The novel Suikoden is a tale of rebellion and courage and its woodblock prints depict men who have been decorated images such as flowers, tigers, dragons and mythical beasts. When the woodblock artists began tattooing human flesh they used the same tools used to create their woodblock prints, such as chisels and gouges. The ink used was Nara Ink also known as Nara black, that famously turns blue green once injected under the skin. Like the scholarly debate over the first tattoos who wore tattoos during this period has also been hotly debated. Some believe that tattoos were flaunted by wealthy merchants who by law were prevented from flaunting their wealth. Others believe it was the lower classes; a third opinion is that tattoos became associated with figures of bravery such as firemen who used the irezumi for protection. By the begging of the Meiji period, that extended from September 1868 to July 1912, the Japanese government, wishing to protect its image and make a good impression with the west, outlawed tattoos, however tattoos were still popular among the criminal elements and fascinated foreigners who travelled to Japan to see the skill of the tattoo artists. During the occupational forces in 1948 tattooing was once again legalized, but their use still retained criminal connotations and association with the notorious Japanese mafia the Yakuza. Today many businesses in Japan such as fitness centers, hot springs and public baths still refuse admission to customers with tattoos. In modern times due to Western influence tattoos have gained popularity amongst Japans youth, although the general consensus is still one of stigma. Unlike the western world in Japan it is not easy to find a tattoo salon outside of tourist areas or around areas frequented by the US military. According to the president of the Japan Tattoo institute Kunihiro Shimada there are only three hundred tattoo artists in Japan, this is largely thanks to years of government suppression. Tattoos are still frowned upon and even today hot springs and public baths, if not refusing to ban people with tattoos entering completely they require anybody with a tattoo that wishes to enter the premises must cover them up away from sight. In 2012, Toru Hashimoto, the mayor of Osaka, started a campaign to rid companies of tattooed employees. An article written about him states, “He is on a mission to force workers in his government to admit to any tattoos in obvious places. If they have them they should have them removed or find work elsewhere.” His beliefs are, on the whole, well received by the public as well as larger tattoo phobic companies. 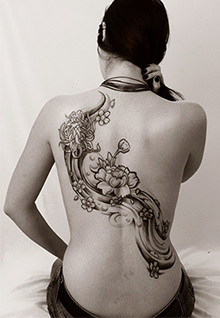 Traditionally in Japan with irezumi, the majority of the tattoo design was left up to the artist. Today having a tattoo in Japan is very similar to having one in the west, where customers take their own designs to the artist or choose from a selection displayed at the salon. Japanese tattoo artists are well versed in all styles of tattoos, not only the traditional Japanese Style, and like the west they are created with electric machines where the ink is injected into the skin after a needle is dipped into it. Japanese tattoo artists are known for the quality of their work, and despite the discrimination in Japan against those with tattoos, it is still a country that is widely thought of as one of the best places to get a good quality ink job. In Japan some very skilled tattoo artists are still allowed to practice the ancient art of Irezumi, but it is very long and painful process and one that will cost a significant amount of money. A Irezumi that covers the arms, upper leg and chest can take up to five years with one session every week and the cost could well exceed 25,000 Euros. The client and the artist well enter lengthy discussions before the artist presents his ideas and reserves the right to not accept the job. If a deal is stuck work begins with the definition of the contours that are usually done freehand and without the use of a stencil. Once the outline is complete the colours and shadows will be added on the weekly visits. Once complete the artist will add his signature to the work, usually on the back in a specially reserved area. The Japanese believe that Asian dragons originated from Japan before spreading to other areas in Asia and as they evolved the developed more toes. However The Koreans and the Chinese believe the opposite to be true, in that the dragons originated in their countries and as they evolved lost their toes. Like all Asian dragons, Japanese dragons are associated with water and rainfall, not fire as they are in Europe where they represent strength, wealth and ferocity. In Japan the dragon represents generosity, wisdom and a strength that is used to benefit mankind. 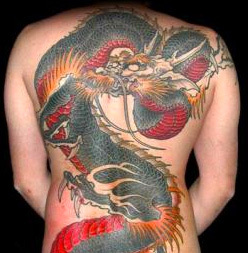 These positive traits have ensured that dragons are among the most popular Japanese tattoo styles. 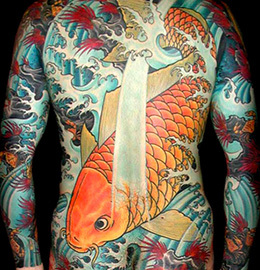 One of the other most popular subjects for a Japanese tattoo is the Koi Carp. Koi Carp are specially bred and native to China. In Eastern folk law they attributed with qualities such as strength and bravery. It is known that the Koi in China would often try to swim upstream in the Yellow River but very few ever made it past a point called the Dragons Gate. A popular belief is that those who did would be rewarded by being transformed into dragons. This is where the symbolism of determination, strong desire to succeed and the idea of transforming into something better comes from. Popular folk law around the world say tells that the phoenix is bird that is consumed by fire only to then rise from its own ashes. This is a story that exists in many cultures throughout history, including Greek and Roman mythology. The symbolism of the phoenix is rebirth and triumph. 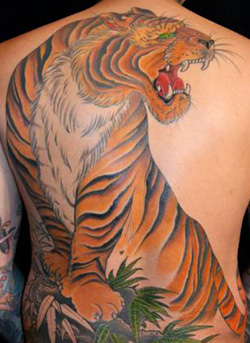 Another powerful subject for tattoos is the tiger who symbolizes courage and strength. Tigers are said to control the wind and are often chosen as part of a tattoo to protect against bad luck, evil spirits and disease. 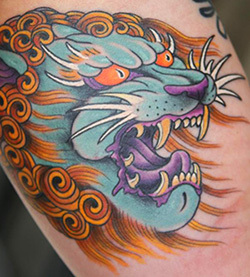 The Fu-Dog or lion tattoo looks like a loin with pointed ears, and also resembles a dog. They also are used for protection and are said to be strong and courageous and are favored by those who have heroic aspirations. The snake holds a wide range of symbolic meanings. They are thought of as protectors who can ward off disaster, bad fortune and disease. They also represent wisdom and protection from the outcome of bad decisions. As snakes shed their skin to reveal a fresh new skin, they are also often associated with healing, regeneration and in Japan wit medicinal rites and remedies. The shedding of the skin also represents a woman who has taken on the strength of man symbolizing holy female attributes and divine femininity. Unlike the western connotation of death, danger and ill fate, skulls in Japan are believe to be a positive representation of the natural circle of life. Typically it can represent change. Japanese flowers have a variety of meanings and are a highly valued design in Japan. The lotus represents understanding, knowledge, enlightenment and life. The cherry blossom is a flower that does not bloom for very long and they are blown from the tree in even the slightest wind. The Japanese see them as a reflection of their own mortality. Chrysanthemums are associated with the emperor and symbolize perfection and in some cases deity as well as happiness, joy and longevity. The rose symbolizes balance, undying love and new beginnings. A rose with a stem is thought to have the contrasting meaning of loss, defense and thoughtlessness. The peony are referred to as the King of Flower and symbolize elegance and wealth. Orchids was said to represent bravery, power and strength. The hibiscus has one simple meaning in Japanese culture and that is 'gentle'. The Oni Mask is very common in Japanese tattoo art and symbolizes a belief in the spirit world where demons carry out their roles of punishing the unjust and evil. Oni are known to be evil but the ones who are good symbolize protection.